Show off your red and white (dishtowel) and blue (hydrangeas). Fold a towel in half over a gallon-size zip-seal bag and cut the towel 1/8 inch larger than the bag. Staple the towel together along the sides; hang with clothespins; add water and flowers. 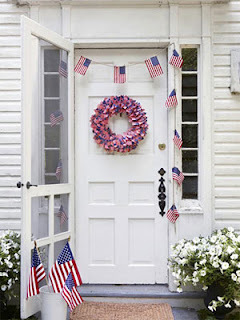 Betsy Ross would delight in this entryway festooned with her signature work. Simply stick mini flag toothpicks into a Styrofoam wreath until the wreath looks full. 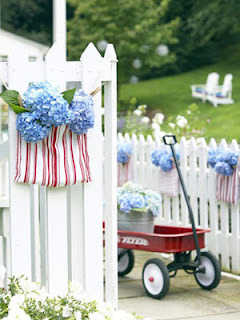 Top it off with a garland of flags clothes-pinned onto twine. 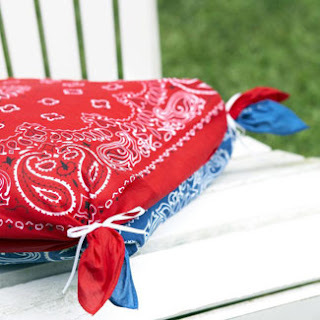 Soften outdoor chairs with no-sew pillow covers crafted from contrasting bandannas. Sandwich one cushion between two scarves, then join each corner together with a rubber band and hide bands with thin ribbon, as shown. 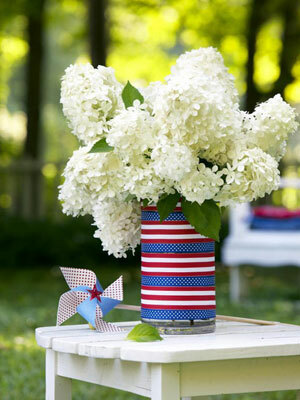 All-white flowers like hydrangeas seem instantly all-American presented in a vase that evokes the stars and stripes. Measure the vase's circumference, then cut lengths of patriotic ribbon to size. Attach with double-sided tape to cover the vase. A tower of potted plants marks a tread-on-me path. Gather three pots and saucers. Fill each pot with soil; stack with saucers in between. 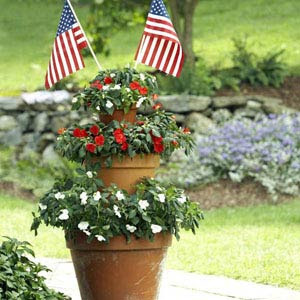 Tuck in-palette impatiens into the soil; pop in a pair of flags. Navigating the backyard buffet is a breeze for plate-balancing guests when you station grab-and-go silverware in glass canning jars. 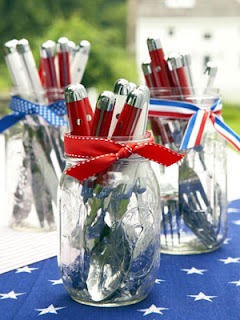 Trim a trio of jars with ribbon remnants, and fill with eco-friendly reusable flatware.